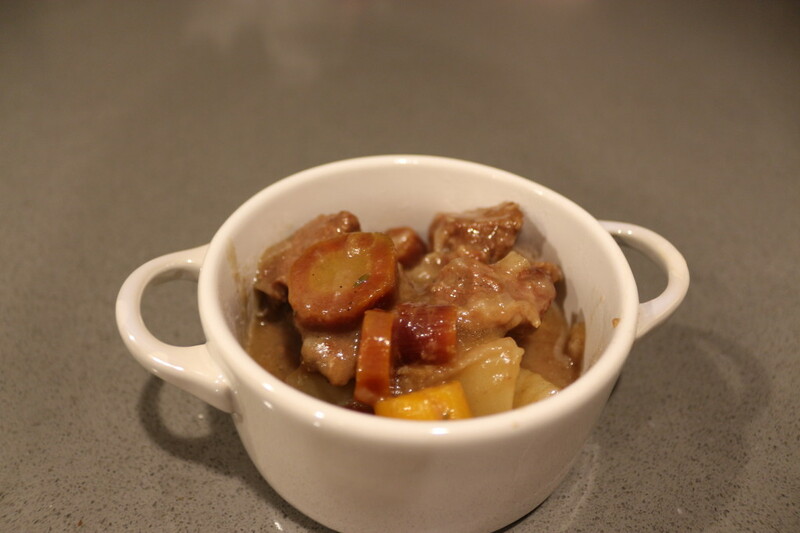 Perusing some of the magazines recently dropped through my mail slot, I came across a recipe for Belgian beef stew in Food & Wine magazine by Andrew Zimmerman. I pulled it out, thinking I could continue on my slow-cooker kick and try to convert this recipe to a slow-cooker version. I told Patrick I would make it, and after reading the instructions, thought it was better to follow the directions (more or less). What happened is no less than a-maz-ing! This stew is rich and flavorful, with tender meat, thick-gravy like base, and delicious veggies. And I apologize that my photos really don’t do this meal justice – if only I could capture smell with a picture – but alas I can’t, so just take my word for it. This. Is. Amazing. 1. After cutting up your beef, season generously with salt and pepper. Then add, the beef, along with the flour, to a quart size Ziploc bag and shake so the beef is coated with the flour. Remove the beef from the bag, shaking off the excess flour. 2. Heat 2 tablespoons of the oil in a heavy pan (I used my Le Creuset) and add 1/3 of the beef, cooking for 5 minutes over moderate to moderate-high heat, allowing the pieces to brown on all sides. 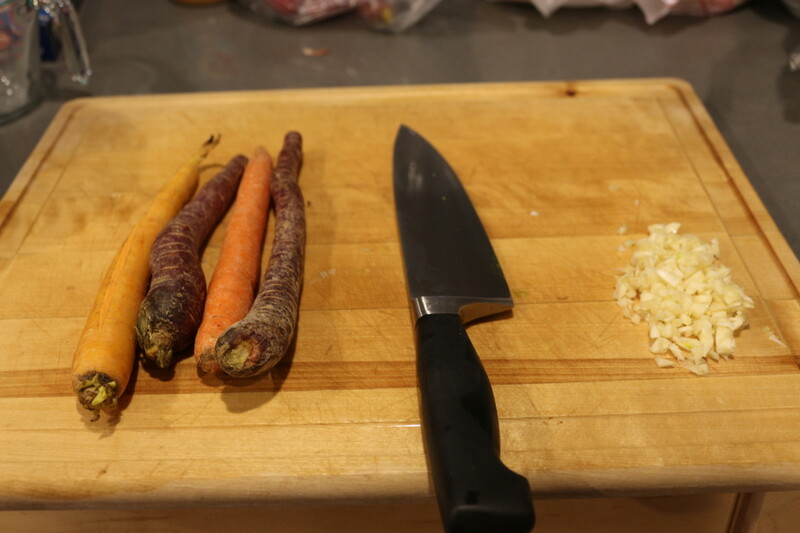 Set aside on a plate and repeat with the other two rounds of beef and oil. 4. If you have oil left in the pan, keep only 2 tablespoons. If you don’t (I didn’t), add two more tablespoons oil. 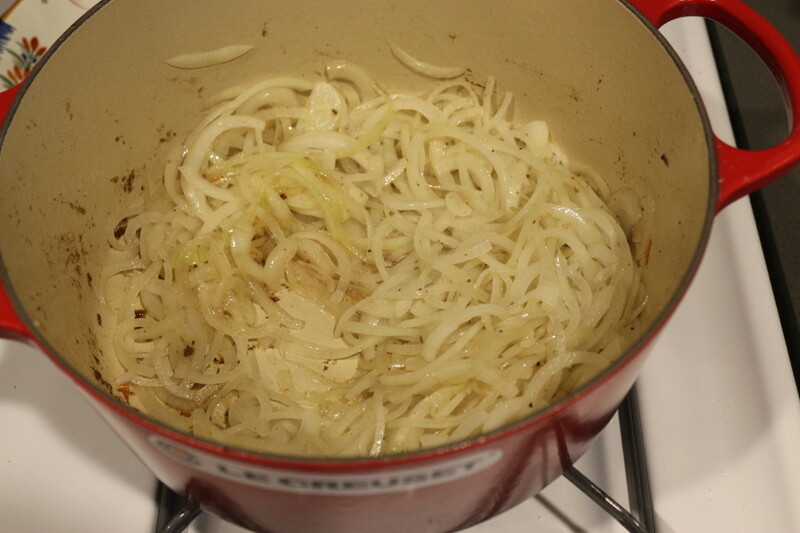 Then add the onions and cook them until softened and browned slightly, about 8 minutes. Stir in the garlic and cook for one minute. 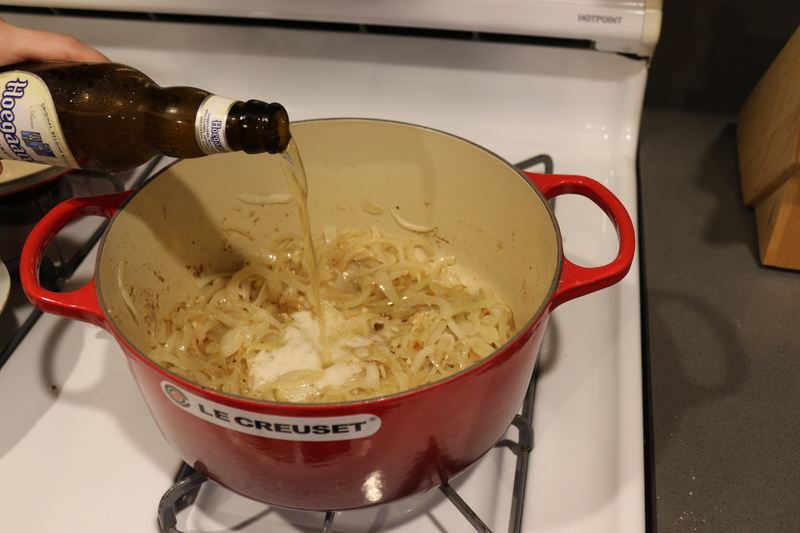 Pour in the bottle of beer, stir, and scrape the browned bits off the bottom of the pan. 5. Add the beef back into the pot along with the stock and the thyme, parsley and bay leaf (you will remove these herbs later). Cover and bring to a boil. Then, transfer to the oven and cook, covered, for 1 and a half hours. 6. 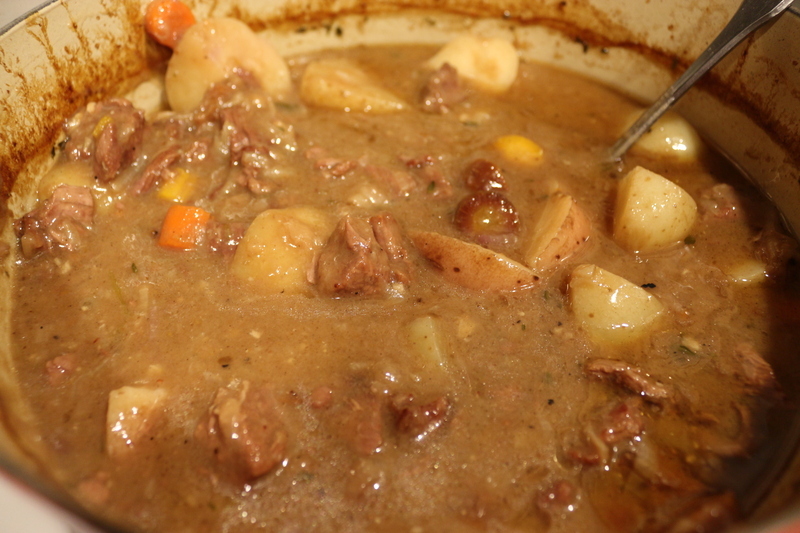 After the 1.5 hours, add the potatoes and carrots to the stew. 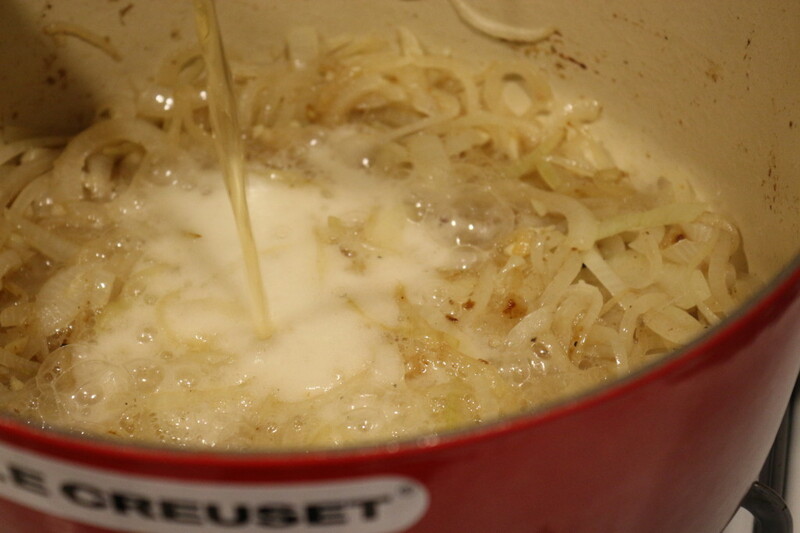 Mix well and cook for another 30 minutes to an hour – until the potatoes are tender. 7. Remove from the oven, remove the thyme/parsley/bay leaf, and stir in the mustard and red wine vinegar. This entry was posted in Mains and tagged Carrots, Potatoes. Bookmark the permalink.